Back in 2015, Isuzu UTE Australia (IUA) introduced the I-VENTURE Club initiative to help its owners get the most out of their D-MAX and MU-X 4X4 vehicles in a safe and structured environment under expert instruction, provided as it happens, by our very own David Wilson. Primarily designed to equip Isuzu owners with the skills and techniques required to handle a variety of off-road terrains, the I-VENTURE Club has also served as an exclusive Isuzu owners club that brings together like minded people and encourages them to join the ’10-per-cent’ of owners that use their 4X4 to seek adventure off the bitumen. “The I-VENTURE Club is all about empowering our customers to buck the perception that the majority of 4×4 vehicles never leave the tarmac,” IUA’s Assistant General Manager – Marketing & PR, Dave Harding said. With just two years under its belt, the I-VENTURE Club has provided 4X4 off-road training to 1,179 customers at 67 events across the country, in destinations as diverse as Moreton Island in Queensland, the Flinders Ranges in South Australia, and the Lancelin Sand Dunes in Western Australia. Several of IUA’s dealers are now conducting their own I-VENTURE Club days to help meet the demand for events from customers, with IUA planning to see almost 1,000 new customers attend events in 2017. The majority of I-VENTURE Club events are conducted over the course of a day, with several longer 3-4 day excursions planned in 2017 to iconic locations such as Queensland’s Fraser Island, and Margaret River in Western Australia. For the 2017 ‘season’ IUA has pressed a fleet of the updated (more powerful, more refined and more comfortable) MY17 D-MAX and MY17 MU-X I-VENTURE Club vehicles into service, all sporting a range of genuine Isuzu UTE accessories. I was lucky enough to see David and the I-VENTURE Club team in action in the Barossa Valley last year (you can read my review of the one day training course here) and it was a ripper of a day. The I-VENTURE Club training sessions are structured for people looking to take their Isuzu 4X4s off-road for the first time and they are run in a non-confrontational, informative and entertaining manner. 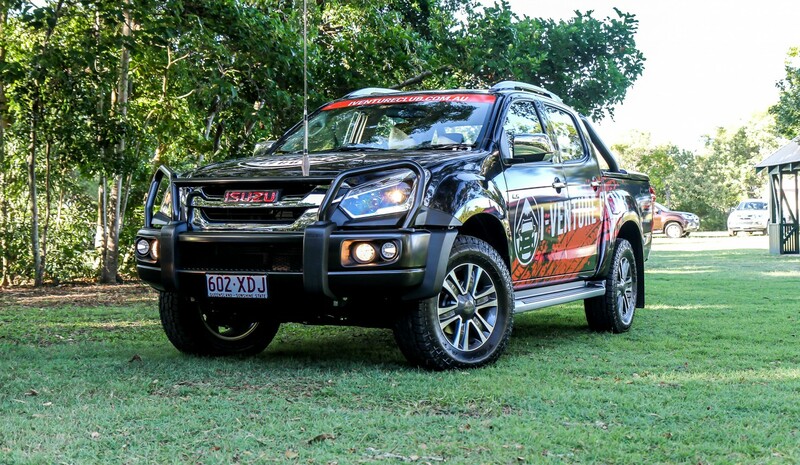 Right now Isuzu UTE Australia is the only 4X4 manufacturer offering buyers of its vehicles the opportunity to develop the skill set required for safe off-road driving. If it’s Flooded. Forget it!